MOVING AWAY FROM her usual trip-hop and electronica, former lead singer of Sneaker Pimps (Becoming X) Kelli Ali has found a new focus. Her pleasing third solo album (CD/DL), Rocking Horse, is tailor-made for her sweet and gentle voice as it sets out on a new adventure into new age folk and mediaeval melodies, settling around soothing contemporary classical music. Recorded over three months last Spring in Edinburgh, Glasgow and Pencaitland, this lovely, well put together album is produced by Max Richter (Vashti Bunyan, composer of The Blue Note Book, Memory House) and was released on 24 November (2008) on One Little Indian, following the single What To Do that came out on 10 November (DL only). With the release of Rocking Horse, says the publicity machine, "the focus is placed on whimsical vocal work and sparse arrangements, crafting unique explorations into modern folk, mediaeval melodies and contemporary classical music. Rocking Horse is a stark abandonment of an electronic past, but this is how it penetrates: Abandoning style for substance, crafting hauntingly ethereal mood pieces adorned by Richter's richly melodic, textured production skills. "This music is timeless, but only in such that time is irrelevant. Mediaeval and baroque sensibilities playfully combine with dark nu-folk to conjure a haunting tapestry of powerful, modern madrigals. As softly-spoken as it is powerful; as dreamy as it is melancholic and as enchanting as it is haunting, Rocking Horse marks the beginning of a new Kelli Ali  influenced by her loves, losses and her life experience." I couldn't have put it better myself! Each track has a special charm, although a distinctive air runs through them. The Savages has hints of raw music accompanying a Tudor minuet whereas shades of electronica and pop knock at Heaven's Door. Urique is superbly guitar-led with a livelier beat that gives Kelli a chance for some entertaining note-dancing vocals. A Storm In A Teacup and the haunting The Kiss are especially calming and relaxing to listen to. When you come to Flowers you'll appreciate the pleasantly-retro echoes and it reeks of Flower Power. Water Under The Bridge simply flows superbly and What To Do has a marvellously addictive musical accompaniment to Kelli's silky vocals. Rocking Horse is influenced by Kelli's nomadic past, during which she travelled across California and Mexico after the release of her last solo album, Psychic Cat in 2004. Urique was written in a sacred canyon in Mexico after hitching a ride with a meths-addicted truck driver, and the title track emerged after a journey through the Californian wilderness. Utilizing Richter's classical background, Rocking Horse shimmers with string quartet and flute arrangements, Cor Anglais [English horn] and vintage organs, alongside the masterful acoustic guitar playing of Marc Pilley, Richter's own piano work and Kelli's endearing vocals.  Rocking Horse was released on 24 November (2008) on One Little Indian. The single What To Do was released on 10 November 2008 (DL only). 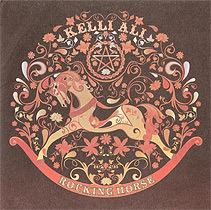 Produced, mixed and engineered by Max Richter, Kelli Ali's Rocking Horse was recorded between March and May (2008) in Cava Studio in Glasgow and Castle Sound Studios, Pencaitland. The album features: Marc Pilley (Acoustic and Electric Guitar and Banjo); Max Richter (Piano and Organs); Simon Rawson (Viola), Helen Duncan (Cello); Sharleen Clapperton and Uli Fenner (Violins); Simon Rawson (Viola); Helen Duncan (Cello); Ruth Morley (Flute); Katherine Macintosh (Cor Anglais and Oboe). The exceptional cover of Rocking Horse symbolizes the paradox of life, lost innocence and the pendulum motion of light and dark influences over the human condition. It is illustrated by Steven Wilson. Kelli Ali was the lead singer of the Sneaker Pimps for their platinum selling Becoming X album. She left the band in 1996 and began focusing on writing her debut solo album Tiger Mouth, along with collaborations and guest appearances, working with Marilyn Manson, Brian Ferry, Bootsy Collins, Linkin Park and Paul Oakenfold. Tiger Mouth, featuring John Densmore of The Doors, was released in 2002 on One Little Indian. Psychic Cat, featuring Andrew Innes (Primal Scream), followed in 2004 and then Kelli left London to go travelling. Eventually, after time spent in California and Mexico, Rocking Horse was conceived and Max Richter was asked to produce the album, based on his work with Vashti Bunyan's Look Aftering. Becoming X (Sneaker Pimps 1995); Tiger Mouth (2002); Psychic Cat (2004); Rocking Horse (2008).